E3 is the time and place for game creators to show their work, and Bethesda is no exception. 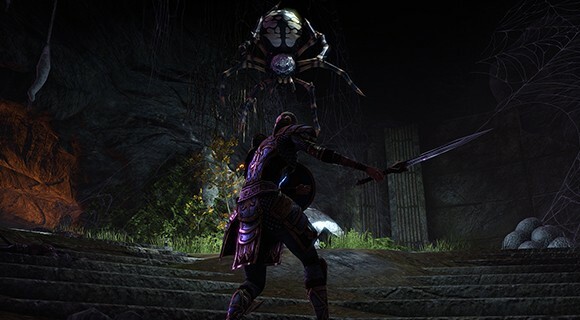 The company offered a quick presentation of The Elder Scrolls Online, which consisted of a short introduction video followed by a brief play session. In the video, Bethesda confirmed what we already knew: that The Elder Scrolls Online will launch on PS4 and Xbox One, along with PC and OS X. The targeted release window is currently spring 2014, a delay from fall 2013 for the PC version. 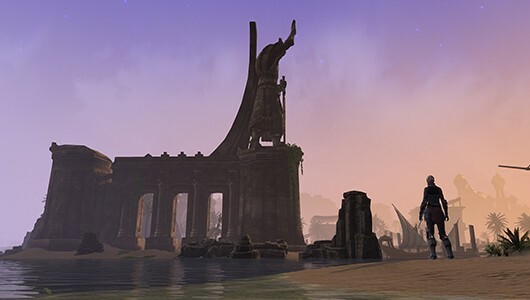 The video also showed off some of the content that wasn’t on display for testers, including high-level PvP battles featuring 200 on-screen players, group combat, first-person mode, and familiar locations like Windhelm and Morrowind. Our own Jasmine Hruschak attended the TESO live demo event and managed to snag a Bethesda employee for an impromptu interview. Check out the full text after the break, and don’t forget to read Andrew’s hands-on as well! Massively: Will the console versions be released at the same time as the PC version? Bethesda: The time window is the same, but they’re not locked to the same date. We’ll release the PC version when it’s ready and the console versions when they’re ready. The timeframe for all of them is spring 2014. Will the game be cross-platform? The people with individual consoles will play within their own platform. So PC players will play with PC, PS4 plays with PS4, and Xbox plays with Xbox. The distinction with that is PC and Mac players will be playing together. 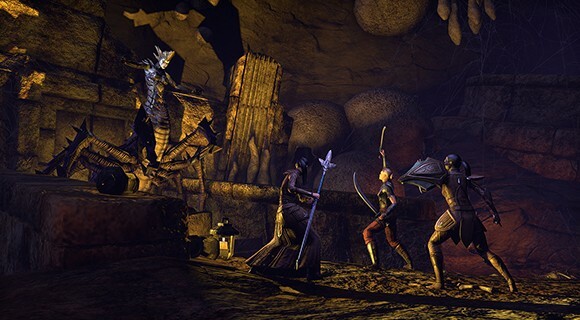 In The Elder Scrolls Online, is there any limit to the crafting skills you can take? You can have all the crafting skills. You can gather all the resources and craft whatever you want. However, there is a specialization component that applies there. So the more you try to spread out, the less you’ll be able to master any one of them. That doesn’t limit you from crafting stuff within; the crafting system is much more exploration-based. It’s not “I can or cannot craft this specific recipe” or “I do or do not have the ingredients to do it,” but much more, “What is this flower that I have? I don’t know what the hidden properties are; let me try and explore that.” The better you are at crafting, the more you know in advance. In previous Elder Scrolls games, skill customization was nearly endless. How do you balance being creative and giving players choices without the inevitable “one guy one-shotting everything” issue? The answer to how you balance it is no more than a design and philosophy question, but it comes down to making sure that everything has counters and strengths and weaknesses. Are we going to see the same amount of depth as in earlier TES games? In picking your class, you have three different skills as a starting point. These are unique to you because you picked that class. But you’ve also got access to all the different weapon types — you can just pick up a weapon, start using it, and master it. You can pick up a sword and shield if you start as a sorcerer class and become a sword and shield user, and that’s fine. Armor, same deal: Light, medium, heavy. They each have strengths. So, for example, if you take light armor, the more you wear, the cheaper your spells are. You start the game with 12 skills. You can join the Mage’s Guild and start learning spells from the Mage’s Guild; you can join the Fighter’s Guild and take feats of strength from the Fighter’s Guild. You can become a werewolf; you can become a vampire. There are 46 skills you can collect in the game, so the 12 you begin with are just the beginning, and as you find new skills, you can progress them. The game literally lets you make the character you want to make. As far as balancing goes, as long as we do a good job of making sure there’s an answer and that all skills have value in certain situations (maybe not in every situation), then there’s a shifting game that happens where people are like, “This is the build that people want to try,” and then everyone’s like, “Well, this is the build that beats that,” and it all goes in a big circle. As long as it isn’t just, “this thing beats this thing,” it never gets boring. There are so many possible spells and abilities and builds in the game that we really haven’t found an end to it. In a traditional MMO, you play the game and level up. 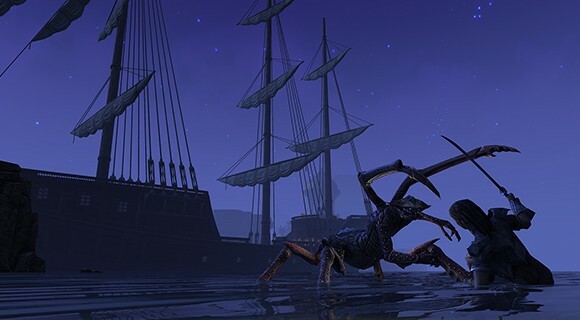 You end up ultimately playing at max level in two or three areas — how are you handling that in The Elder Scrolls Online? Is there level scaling, can you go back, can you do older content? You can level all the way from 1 to 50 with your character; that’s 140 to 150 hours of content. Once you get to level 50, maybe you don’t want to participate in the PvP endgame or you’re not interested in group dungeons, but you really want to play more of the game. You can take the character and go back through the other alliances, but all of the content is scaled to level 50. So you can start playing through another chunk of content, but everything is harder. Once you’ve played through all of that, you can do it again through the remaining alliance, but everything is even harder. We call it “50+” and “50++.” Basically there are two additional tracks of content you can use with each character. Can I go back to a level 35 zone and start in the middle? Or do I have to start again? There are three different tracks of content that go with the three alliances. You don’t have to abandon your track; you can go back to that level 35 zone if you miss something. You’ll be level 50 and the content will still be level 35, but in your original track, all the people you’ve met along the way and any changes you’ve made to the world will persist. If you go to a brand-new track, it’s sort of like starting over with a brand-new character, except you don’t have to start a new character. We let you continue to progress because the skill system is really open-ended. When you hit level 50, you’ve probably maxed 20% of the skills in the game. If you want to keep making your character stronger without PvP or dungeons, that’s a really good way to do it.